Guess who has some really good friends? Me!! When my friend heard me consider buying a sewing machine to learn on, she generously offered to lend me her spare! Cool. She'd even show me how to thread it! So off I went to spend the evening with her on Saturday and she taught me the basics of how to get going. If that weren't lucky enough, another friend heard about my quest and sent me this beautiful book filled beautiful uses for vintage French fabric. I don't have any of that...but its just a really lovely book to look at and get inspiration from. I already had read Sew Everything Worship by Diana Rupp. It seems like a great way to get started and she lays out all the basics in simple terms (for a sewing simpleton like me). Now that I had the books and the machine, I just had to run out to Brooklyn General, the only fabric store I know of around here to pick up some pretty fabric, a pair of sewing scissors and some thread. Now the question is - what should I make?? I'm overwelmed with possibilities here. Any former sewing novices care to recommend a good first project? New to your blog- loving it...start off easy - dishtowels, trim out bath towels/handtowels, make pillows or slipcovers for pillows, those are all quick and easy and so fun!!! good luck! I'd say pillows are a good starting project. They are fairly simple and you can make them cute with trim, etc. Good luck!! I recommend a handbag, pillows, potholders, a drawstring skirt. I'm not a seamstress, so this may be a difficult project - but what about a bed skirt? Or, add a layer to existing window treatments? I say start new with pillows...easy and cute, and can always use them...but thats what I would do. Something housey for sure! Pillows are a good option, and if you are feeling adventurous, maybe one with a zip closure, or a few buttons, both of which are good to know how to do! Dish towels would be a good start- that way you can work on straight lines and get use to the feel of your machine. Be sure to show us your completed project. Have FUN! Curtains and throw pillows are a simple project. 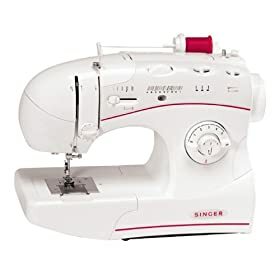 I'm a sewing novice too, so I look forward to seeing everyone's recommendations. Thanks for such a great post! My first projects were door draft stoppers and rice-filled pillows that you can heat up in the microwave. I'm pretty new to sewing too and have recently tried my first projects that actually follow patterns. Good luck! An important and helpful term for me was "back stitch". I was tying little knots to keep the stitch together. I'd love to sew roman blinds for my living room but I'm afraid it might be too advanced of a project. Dishtowels are a great idea. I always need those. In Jr. High all the kids make aprons. It teaches you how to follow a pattern, sew a straight line and it is easy. We can learn together! I picked up a sewing machine at a yardsale last fall & now it's set up on a table in my den. I've learned how to thread the bobbins & bought extra thread colors, so now I'm ready to get going too. I've got a slipcover project in mind, probably too big for me to tackle, but I'm gonna anyway. Good for you! I think sewing has become a lost art, but oh the money we can save by trying it. First, I LOVE you and your blog! You're my hero! I vote for dinner napkins for two reasons: a) very easy to just hem up four sides and b) good for the eco-conscious. You might also like to try a little hand embroidery on them too. Fun! I can't wait to see what you do! Good for you!! Pillows and tote bags are good -- they are all my beginners' hands have managed. And I have this handmade wrap skirt that I bought specifically because it's an easy looking "pattern" to use -- basically when you lay it down, it looks like a big Christmas tree skirt. One of these days I'll actually *do* something about it! I'm also hoping to take a class to make a laptop cover...it's a beginner's class, so we chall see. ur gonna have so much fun!!! i'm a new seamstress too - just bought my machine in dec. - and like everyone is saying here - stick to straight lines first. towels/ pillows/ napkins/ placemats/ shower curtains - they're easier and you'll beuild uop confidence fast - and when you SEE your beautiful creations u'll be soo psyched! seriously cannot wait to see what you come up with! My first project was napkins. Easy, fun and rewarding every time you use them. Drawstring bags are very simple for beginners - great for storing shoes, accessories, as a handbag organiser and other odds & ends. Like prior people, I started with Pillows. They definitely are doable and make you feel like Martha after you are done. My second project was curtains. Pretty simple and such great variety can be done. Okay, I love the new blog look (you never make a misstep), can't relate to the sewing (I got a D in sewing in Home Ec, and hate it so much it should have been an F), and have seriosu envy over that fabric. What to make with it? Well, you could start with a new slipcover for my living room chair! I'd REALLY appreciate it!! Easy and instant gratification are napkins! One suggestion, when you sew, always iron as you go to produce clean finishes. Have fun and remember to whistle whilest you work! I also love making jewelry rolls and pencil cases. I will post them. Pillows, tablecloths, or napkins are all fairly easy to start with. Sewing is a lot of fun, it won't take long before you are addicted. i see a lot of people have already suggested this, but i found pillows to be the easiest! I'm so happy you'll be sewing. I'm sure I'll love everything and then be envious that I'm not doing the exact same thing. For projects, how about an apron. Not sure how hard that is by I think it would work well with that fabric. Great fabric, btw! Or cards backed in fabric with a zig zag stitch. I love when fabric and zig zag stitch are used in cards. Unexpected and so beautiful. Granted, I have no idea how hard that might be but magazines always make it seem easy and simple. Oooooo. I bought a sewing/ embroidery machine 1 month ago and have yet to crack it out of its box. I love reading the responses here. Anyone have any good ideas for sewing books for beginners? I wish I knew how to sew - good luck with it and have fun. Can't wait to see what you whip up, xv. There's a Joann's on Staten Island on Forest Ave just off the expressway. Good place for patterns and very inexpensive fabric, plus all of the notions and supplies (pins, rulers etc) you'll need. Purl Soho is a great dual fabric/knitting shop (along the lines of Brooklyn General) that's good if you need unique fabric immediately (kind of pricey). Mood fabrics is the famous NYC place. And of course that entire FIT area. Pillows, bags, apron, pajama pants, a small quilt, basic bathrobe are great starting places for sewing. If you want more books with simple patterns and wonderful writing, check out the offerings from Amy Butler and Anna Maria Horner. They both also have amazing fabric lines. Also, quilting rulers and a rotary cutter are the best thing since sliced bread when it comes to sewing. Patternreview.com and any of the crafting sites (getcrafty, craftster) will be great resources for asking questions. Sorry, could go on forever. Good luck with your new hobby! Love the blog! I am just teaching myself to sew as well. I started with aprons. Gets you good at sewing straight lines.